My brain must be in hibernation mode, because I’m paying attention to my house again (beyond the weekly upkeep, I mean). Just when I thought I was content with everything (with extra touches courtesy of Hurricane Hannah), I realized our bedroom needs some love. It’s sad. Everything is mismatched due to the light blue walls I chose (too hastily) LAST November, and I never picked new bedding, curtains, etc for the winter months. The room also houses our elliptical machine (and will for a while); but I am determined to make the room feel a little cozier. 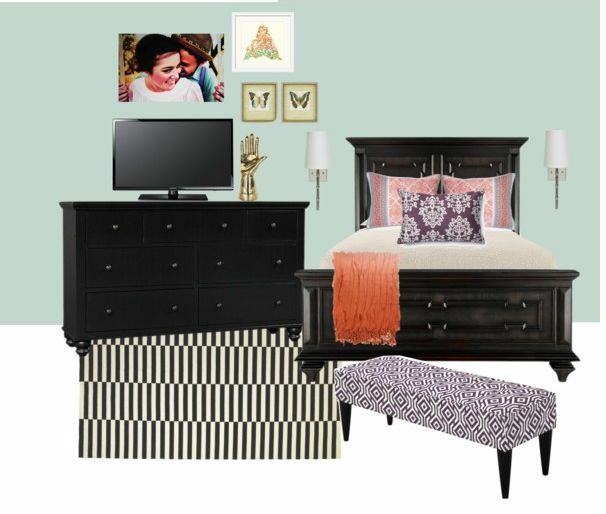 Our budget doesn’t allow a complete redo, and my husband might kill me if I say I want to paint again, so I am planning to work on creatively making our bedroom nicer over the next few months without buying much. This means mostly using what I’ve already got, possibly working with the coral-ish bedding/shams I have, as well as the bench I upholstered in a random purple pattern. I made the mock up above to tie it all together, but I’m not sure I love the color combo. Any feedback? I normally have no problems making colors “work” but that light blue is stumping me completely. I do NOT want an otherwise neutral palette just to make the wall color work. I need color! Ideas are appreciated.